Overview - It's Halloween, 1991. Near Gloucester, Massachusetts, the six members of the Andrea Gail, a swordfishing boat, head out to sea for their last trip of the season. Unbeknownst to them, a shockingly brutal storm is slowly gaining steam. Before the National Weather Bureau has a chance to inform the crew of the impending danger, it's too late. The resulting battle with three merging weather fronts--an unheralded natural disaster--is grueling and tragic. Based on the true-life best selling novel by Sebastian Junger, The Perfect Storm stars George Clooney, Mark Wahlberg, Diane Lane and is directed by Wolfgang Petersen. Based on the best-selling novel by Sebastian Junger and inspired by true events, 'The Perfect Storm' tells the tale of the ill-fated Andrea Gail. In October 1991, the fishing boat would embark on a commercial fishing expedition at the tail-end of a dismal season. Stung by a weak summer catch and desperately in need of income to see them through the coming long winter months, the boat's blue collar crew set out off into barely charted waters hoping for a lucrative haul. But the crew will soon make a life-altering decision -- despite their devoted families waiting for them back home, the Gail would ignore warnings of an dire storm brewing, determined to prove their might against nature's primal fury. The results would be tragic. Like its title, 'The Perfect Storm' is a movie that seems like the perfect recipe for Hollywood success. Based on a huge best-seller, backed by a major studio with a massive budget, loaded with A-list stars and graced with a story filled with realistic action and genuine pathos, it is hard to imagine it could ever have failed. (Really, when you have George Clooney, Mark Wahlberg, Diane Lane, Mary Elizabeth Mastrantonio, and John C. Reilly in your movie, how can you go wrong?) And it was a big hit in 2000, grossing nearly $300 million worldwide. However, eight years on, 'The Perfect Storm's reputation is now a rather curious one, a film not so much regarded poorly as not regarded much at all. An efficient, well-made film, its emotional impact and resonance nevertheless have failed to endure beyond its end credits. 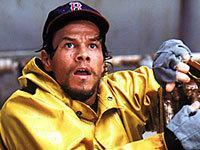 Watching 'The Perfect Storm' yet again on Blu-ray, I'm left with the same impression I had upon my initial viewing. It is certainly an entertaining film, commendable in its respect for the real-life men of the Andrea Gail, handsomely mounted, well acted and boasting plenty of effective action sequences,. Still, it left me feeling oddly cold, not quite tugging at my heartstrings the way it could have, and should have. In hindsight, perhaps the hiring of 'Das Boot' director Wolfgang Petersen was not the best choice, however logical it must have seemed. Petersen has always been adept at staging action, especially involving water. Witness even his recent disappointing 'Poseidon,' which while a failure as a story contains some terrific disaster sequences. Alas, he brought that same misplaced focus on spectacle over intimacy to 'The Perfect Storm.' Time and again, we are taken away from the core moral and human dramas facing the crew of the Andrea Gail for dull if well-staged action setpieces (shark attacks crew member, Navy attempts rescue of fellow boat lost at sea, etc.). These parallel stories add little to not only the film's main narrative thrust but also generate little interest on their own. 'The Perfect Storm' often feels more like a TV movie in its plot construction than a focused, full-length motion picture. These subplots may have worked well on the page, but in a two-hour movie, they only distract us from the riveting core story of the men of the Andrea Gail and their families back home. Yet I continue to admire 'The Perfect Storm,' because it is one of the few movies made by a major studio in recent memory that deals with the sensitive issue of class in our society. The decision the crew of the Andrea Gail ultimately made was informed largely by the men's station in life. The movie argues (none too subtly, I might add) that the harsh realities of America's capitalistic infrastructure and our culture's generally poor regard for the efforts of the blue collar worker contributed as much to the tragic fate of the Gail as any misjudgment by its crew. That makes 'The Perfect Storm' rather progressive, even subversive, for a major Hollywood movie. I still wish I had felt more for the men by the film's end, but 'The Perfect Storm' is still a film worth seeing. And it is certainly enjoyable, regardless of whatever debatable cinematic and social virtues it may possess. When I originally reviewed 'The Perfect Storm' on HD DVD, I expressed my disappointment at the transfer. Instantly notorious as a 1080i "upconvert," it suffered from excessive softness, artifacts and a generally lackluster presentation. The good news with the Blu-ray is that Warner has upgraded to a true 1080p/VC-1 encode. The bad news is that this appears to be the same master, so the basics of the image haven't changed, and any improvements are relatively minor. Though it was not announced with such, Warner has ported over to Blu-ray the same audio options from the HD DVD. We get a Dolby TrueHD 5.1 Surround track (48kHz/16-bit), plus a host of Dolby Digital EX 5.1 Surround dubs in various languages. The TrueHD is the highlight of the disc, thanks to the film's excellent sound design. This is a very aggressive mix, and since the film contains so much action it is almost constantly enveloping. 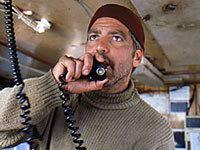 Many scenes are highlights, particularly the extended climax, or a sequence when a private charter boat is also lost in the storm is rescued by the Coast Guard. The sense of reality, depth and fine detail to the sounds here is excellent. The film's later action sequences also sound just as terrific, with palpable ambiance and atmosphere. 'The Perfect Storm' is also full of surprisingly subtlety throughout, and I remain impressed by the little details I'd never heard before. The final scenes are particularly effective, with the power of the score and haunting undersea sound effects combining to create discrete shadings that are well-preserved by the TrueHD track. I could even make out the sound of individual gurglings and pounding rain on the surface of the water that are startling in their clarity. 'The Perfect Storm' is also a wonderfully dynamic presentation, with excellent deep bass (the subwoofer gets a real workout) and a slickness to the recording that's as good as any big-budget Hollywood spectacle you're likely to here. Dialogue does not get lost in the mix either, as it is well-placed in the center channel and never has to fight with the score and effects for dominance. Despite being a rehash of the TrueHD mix found on the previous HD DVD, 'The Perfect Storm' holds up as a demo-worthy soundtrack. When 'The Perfect Storm' was first released on standard DVD in 2000, its extras were a pretty big deal -- back when multiple commentaries and a featurette still seemed exciting and comprehensive. Six years on came the HD DVD release, which was a stark reminder of how far the art of supplemental features has come. Anyway, this rather ordinary set of extras is quite dated, if decent enough. All video materials are in 480p/i/MPEG-2 video only, and include the same subtitle options as the main feature. 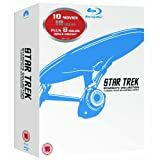 Audio Commentaries - First up are not one but three audio commentaries, the first with director Wolfgang Petersen, the second with author Sebastian Junger, and the third with visual effects supervisor Steen Fangmeier and visual effects producer Helen Ostenberg Elswit. Unfortunately (and my apologies to Fangmeier and Elswit), but I found the effects commentary incredibly dull, not only because two hours is just too much time to devote solely to visual effects, but also because I find this type of material is better suited to a video-based feature. I liked the Junger track better, and he is probably the most fascinating, because the real-life tale of the Andrea Gail is undoubtedly riveting. Petersen also offers a wealth of information, though he is a bit more dry than Junger, and often repeats the material on the effects commentary when he discusses the film's big action setpieces. Featurette: " "HBO First Look: The Perfect Storm" (SD, 23 minutes) -- The first of three features, this is one of those utterly typical EPK things made before the movie was released. Entirely self-serving and promotional, al it does is recap the plot and tell us how great the movie is gonna be. Featurette: "Witness to the Storm" (SD, 4 minutes) - Much better are "Witness to the Storm," which interviews people and fisherman who actually witnessed the "storm of the century" as depicted in the film. Nice background, if far too short. Still Gallery (SD) - The last of the major extras is the "Yours Forever" stills montage, which is nicely done with some underscore from the movie. Theatrical Trailer (SD) - Rounding it out is the film's theatrical trailer, in standard-def. I liked 'The Perfect Storm,' but wished I could have loved it. Still, it's an entertaining, sometimes captivating film, and it's certainly tailor-made for home theater. Alas, Warner has done nothing to upgrade the video and audio for Blu-ray versus the previous, underwhelming HD DVD version. I wish the picture were sharper, and the extras are pretty ho-hum. 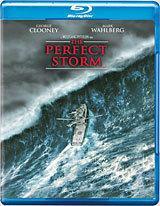 'The Perfect Storm' is far from a terrible Blu-ray, but it is hardly one of Warner's top catalog efforts.